Discussion in 'What's Going On' started by Sidmouth, Nov 6, 2018. Appears to be very popular, 25 min queue on website, 264 ahead of me, nearly 7000 already booked it seems. Sounds like the locomotive will be decked out with christmas glitter and other nonsense. the question for me is will the engine have a big headlamp ? Bifur01, Greenway and Bean-counter like this. Will it skate across a frozen lake? Bluenosejohn and Nick Gough like this. This has all the makings of being a truly fantastic launch venture for Vintage Trains & it's other partners. It has become a major news item in the Birmingham Mail with the the volume & Speed of ticket sales being quite breathtaking. £40K tickets sold as of 8 Hours ago. Some trains are already sold out ! Amazing ........ nearly as fast ticket sales as for the Led Zeppelin reunion concerts in 2017 ? Vintage Trains Management and all it's share holders & other stakeholders should be tickled pink to have such publicity & be associated with such a venture. I expect the Shareholders AGM should now be a rather jolly affair ? I wasn't a Vintage Trains Shareholder .........................but I soon will be ! Could it have a future negative impact on the very popular SVR Santa programme ? Sounds like fun for all the family! 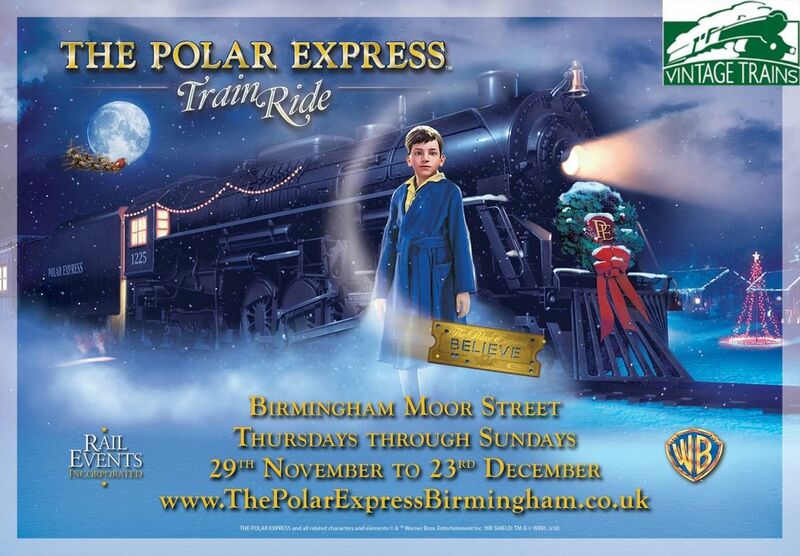 THE POLAR EXPRESS ™ Train Ride is coming to Birmingham this Christmas! We are delighted to confirm we will begin to operate steam hauled passenger trains later this month with The Polar Express ™ to and from Birmingham Moor Street. The performances run from Thursdays to Sundays, 29th November through 23rd December. On THE POLAR EXPRESS™ Train Ride, the magic and charm of the 2004 motion picture THE POLAR EXPRESS™ will be theatrically re-created so that you and your guests can immerse yourselves in the sights, sounds and intrigue of this classic children’s tale. Join us and prepare to be surrounded by the enchantment and wonder of the Christmas season! As you and your guests arrive in the festively decorated THE POLAR EXPRESS™ Platform 4 at Birmingham Moor Street station, you can almost sense the faint sound of sleigh bells in the distance and the fun begins. Before long, scenes from the movie come to life as dancing Chefs and Waiters arrive serving cookies and hot chocolate. You will be totally engrossed as the story of The Polar Express by Chris Van Allsburg is told in its entirety. Chefs show pages from the beautifully illustrated book for the whole carriage to follow and families who bring their own copies can read along too. A smile comes to your face as you see your child absorbed in the wonderment of the story. Upon arrival at the North Pole, keep your eyes peeled for Santa, his sleigh, a bag of toys and a giant Christmas tree. After the train slows to a stop, you find yourself delighting in the inspiring climax of the story as Santa appears on the train! As the train departs the North Pole for the return voyage home, the adventure is not over. Santa appears to present each child (0 – 110!) with their very own “First Gift of Christmas”, a silver bell from his sleigh. Reflecting on the story, we would remind you to check your pockets for holes! Chefs on board lead the passengers in singing favourite Christmas Carols as the train heads back to Moor Street station. After the whole performance lasting approximately one hour, passengers depart the train but the magic and fun continues as the children have a chance to see what the Elves have created in their workshops. Don’t forget to visit the post room to write and post your letters to Santa. We encourage our guests, young and old to wear pyjamas just as the children did in the Film. The children will love it but maybe you can persuade Mums, Dads, Grannies and Grandpas to join in too, the atmosphere in the train comes alive for a truly magical experience! This is where your participation in the story of The Polar Express comes to an end. However, our hope for your whole family is that your Christmas season has been enriched and memories from your experience will endure for years to come. acorb and Greenway like this. They'll never get gauging for that loco from Network Rail! oldmrheath, RobT, oddsocks and 5 others like this. ...............or Earlswood Lakes, a place frequently passed by the Shakespeare Expresses. Looks like another gig for a certain S160 ? Separate email to shareholders today, states that VT are hiring in the coaching stock from the SRPS for this as approval of the use of their own stock for mainline passenger services is currently pending the required ORR industry consultation. Also says the motive power will be 'Polar Star'... I would guess Rood Ashton Hall. A quick look on wikipedia shows that name has historically been carried by a Britannia, a GWR Star and GWR Broad Gauge 2-2-2! .... and GWR Broad Gauge 2-2-2! That would send the Network Rail gauging computer into total meltdown! flying scotsman123, oldmrheath, Jamessquared and 3 others like this. Weardale apparently dropped Polar Express despite good numbers due to franchise costs, another Thomas ? 3278 sits needing finishing at tyseley although not sure who owns it now . "...dancing Chefs and Waiters arrive serving cookies and hot chocolate..." It doesn't sound like my sort of tour, but I'm a bit of a "grinch". It's a hugely ambitious way to launch VT's independent operations, and it will be a minor miracle if there are no glitches, but something tells me they'll pull it off and I wish them every success. And yes, the SVR and other established Santa operators, may need to look to their laurels. While approvals for safety are of course important, it does seem that the process is unduly bureaucratic. VT's own coaches were in regular use carrying paying passengers on West Coast's safety case until about a year ago and have had work done on them since then to make them better; yet they now can't be used for paying passengers until the industry consultation has taken place. Meanwhile SRPS's coaches can be used, on VT's own safety case, even though they are probably no better and may even be not quite so good. Don't forget there is a Polar Express operation at the Telford Steam Railway which according to the latest Steam Railway is looking to fund it's extension to Ironbridge from it. This has been immensely successful in recent years . As a Shareholder I appreciate the (belated) email and the early ticket sales are certainly promising. The market for Christmas experiences is hugely competitive, so this operation is very risky as a debut venture, let's hope it goes down well and VT are able to use this as a good spring board for next year. From their email, a good chunk of cash from this operation will be worthwhile to fund their rolling stock repairs. "...dancing Chefs and Waiters arrive serving cookies and hot chocolate..."
I’ll buy a drink for anyone who gets a photo of Ben Vintage-Trains dancing around whilst he serves cookies and hot chocolate . flying scotsman123, MellishR, green five and 1 other person like this. Should raise the profile of VT quite successfully. The Polar Express at the Telford Steam Railway is already sold out for 2018.